Team up with another teacher to buy these boxes in multiples. 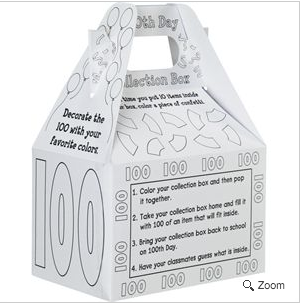 They keep those 100th day collections corralled and the "homework" of decorating and planning clues about what's inside provides some great circle time conversation. The boxes are available in English only. Sorting mats made counting easier. Try walking around as students count their collection onto their mat with a checklist making note of who has that counting by 10 vocabulary down and who is getting stuck around 50. If you photograph each collection there is a page in the 100th Day Passport for students to attach their photo and describe their collection. Notice that the mats include language, not just numerals, (30 reads 'trente', give them print! ).